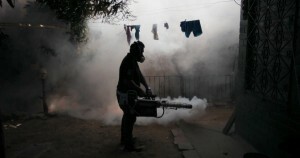 On Thursday, El Salvador urged women leaving in the Central American country to avoid becoming pregnant until 2018 in order to avoid their babies from developing birth defects due to the Zika mosquito borne virus that has rampaged across the Americas. The Zika virus is carried by the Aedes aegypti mosquito that is known to also carry the yellow fever, Chikungunya and dengue viruses. Health officials are not sure why this virus, which was detected first in 1947 in Africa but not known to the Americas until 2015, is spreading in such a rapid fashion in Brazil and many neighboring countries. Although there is ongoing research, significant evidence in the South American country of Brazil has linked Zika infections to the increased number of microcephaly cases. This disorder is neurological and causes babies to be born with undersized craniums as well as brains. Eduardo Espinoza the Deputy Minister of Health announced that the government would like to suggest all women who are of fertile age take steps in planning pregnancies and avoid becoming pregnant this year as well as next. He said the announcement by the government was done because 5,397 Zika virus cases were detected across El Salvador during 2015 and the first two weeks of 2016. Official figures indicate that 96 pregnant women are believed to have contracted the Zika virus, but thus far, none has given birth to children with microcephaly. In Colombia, where the second highest infection rate in the world behind just Brazil can be found, the government has also advised women to delay having children but just for the next six to seven months. In Brazil, there have been over 3,500 microcephaly cases and 46 deaths of infants from October 22 of 2015 through January 9 of 2016. Health authorities in the South American nation confirmed that there were two miscarriages and two newborns that died with 24 hours of being born that tested positive for Zika, The mothers had become ill with fever and rash during their pregnancy.